Any table can be transformed with a few table decorations. Store-bought decorations, however, are not just expensive, they can also be far from environmentally friendly. It's not very "green" to buy new decorations that will be discarded; additionally, their production and transportation aren't often "green", either. Instead, make table decorations out of recycled materials. 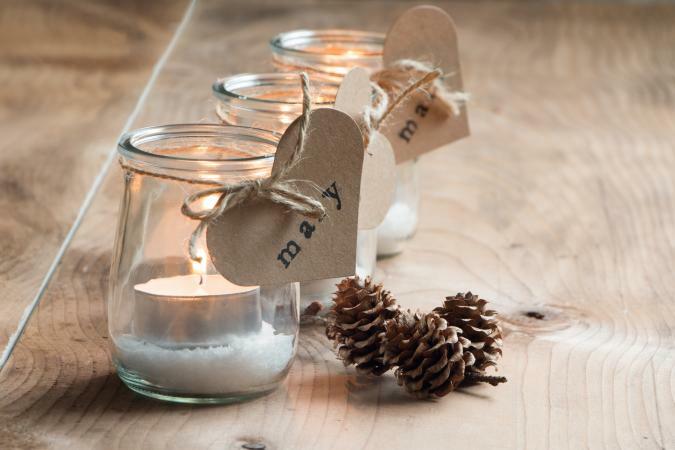 If you fancy having a go at making your own special table decorations, try these three ideas. You'll not only reduce the amount of discarded items that are put out for waste or into landfills, you will create unusual and interesting items. Whether it is a table for a special dinner for two, a large wedding celebration or a huge party, some well-placed decorations can make all the difference. One way of really adding atmosphere and ambiance to a table is with the addition of candles. Beautiful candles are readily available and these need candle holders of some description to protect the candle. These are simple to make out of a wide variety of materials. 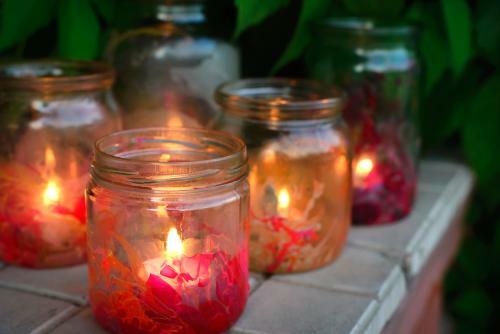 Glass jars make lovely candle holders for tea lights and other small candles. These are great to decorate with glass paints or beads. Pick colors that fit in with the overall color scheme and this will ensure that they complement the table décor. Another way to make candle holders is to place them in the top of wine bottles. This makes a very glamorous table decoration with a slight retro feel. Any table looks great with a few flowers to add some natural color. The flowers need to be presented in a suitable vessel and there are a number of ways of making great table decorations with flowers. Any waterproof vessel can hold a few flowers - discarded soft drink containers can be cut down, for instance, and wrapped in recycled paper. 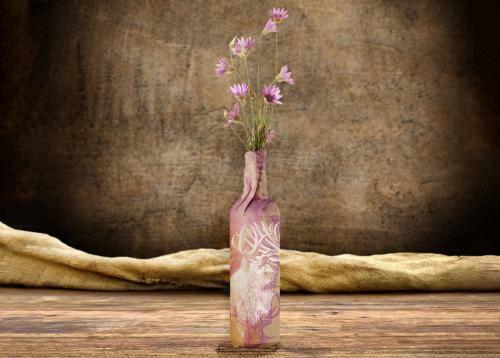 These will look lovely and the paper will disguise the fact that the vase has been made from a recycled drink container! A wine bottle is the perfect vessel for a festive celebration. Use printed shopping bags with graphics in a color and design that match your party décor to really make a statement. 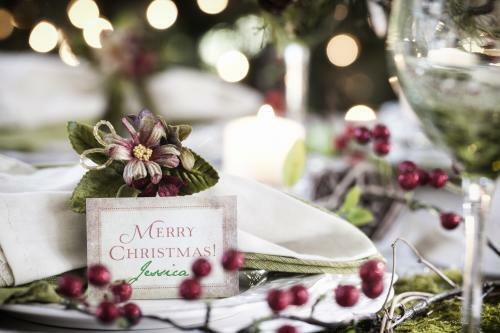 Place settings needn't be made with new cardstock that is expensive in both cost and to the environment. Instead, why not make place settings from recycled greeting cards. These will make unusual and very different place settings. The cards can be picked to match the overall color scheme and if the names are written in a color coordinated pen, then the finished effect is going to be very attractive. To make great table decorations, follow these tips. Let people know what you are planning - they can then help by collecting items that will be great for recycling into table decorations. Pick a color scheme and apply this throughout the table decorations. A few sheets of colored recycled paper and some eco-friendly paint will help to follow the color scheme through. Keep a look out for interesting shaped items as these can make great one-of-a-kind decorations. Unusual shaped glass jars, for instance, are simple to recycle and can be given a new lease of life in a variety of ways. Old pieces of wire, springs or other items can be transformed with metallic paint into miniature works of art. If you make your own decorations for other occasions, for instance, Christmas, why not take a look and see if any of these projects and ideas would adapt to table decorations. Recycling materials to make great table decorations is extremely satisfying. Recycled materials can be made into wonderful table décor that will be remembered and talked about for many years to come.